Over the last decade we have invested in offering market leading, award winning platforms to our clients be they hedge funds, banks or corporations. Our platforms allow our clients to access liquidity when it suits them, manage their positions and optimise their FX activities. Find out more about them. Citi VelocitySM Trading Our new trading platform offers significant advantages to our institutional clients. CitiFX PulseSM Full suite of pre-trade market information including news, research and exposure management tools. CitiFXSM Click Intuitive and real-time post-trade reporting platform. CitiFXSM Intelligent Orders Algorithmic execution strategies that clients can utilise via a range of electronic channels. Citi InstantFXSMOffers customers the home country cost of overseas internet purchases online. 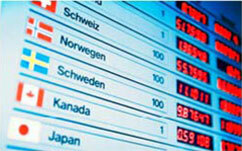 CitiFXSM is probably the best known name in the FX market around the world. Our increasing investment in technology has seen us roll out award winning applications enabling our clients to improve the performance of their business and access the markets 24 hours a day. Take a look at the awards we have won. To find out more about our best in class electronic platforms please contact efxsales@citi.com.